Labour today accused David Davis of attempting to “rule by decree” as MPs finally began to debate the contents of the Tories’ Brexit bill. 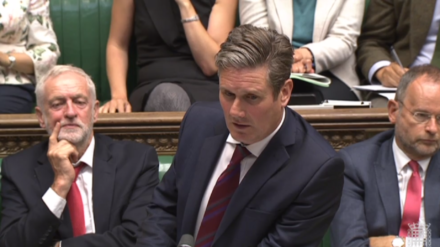 Keir Starmer condemned the government’s “unprecedented power grab” as Labour MPs turned out in force – including Jeremy Corbyn – to debate the repeal bill. The shadow Brexit secretary was seeking to move on from a long period of uncertainty over Labour’s Brexit position after the party last month said it would seek Britain in the single market and customs union during an extended transition period. His opposite number, Davis, delivered a gleeful attack on Labour’s position which he described as a “fundamental misrepresentation of… our democratic process” and “reckless in the extreme”. Starmer, a former barrister, gave a lengthy and detailed response which some pundits described as a “forensic” analysis. “He (Davis) is keen to portray this bill as a technical exercise converting EU law into our law without raising any serious constitutional issues about the role of parliament. Nothing could be further than the truth. Earlier in the day Davis quoted a LabourList blog by Stephen Kinnock when he responded at Brexit question time in the Commons. The Aberavon MP had described the his party’s single market u-turn as “calling time on the ambiguity that had come to define Labour’s approach to Brexit since the referendum”. “What was that ambiguity?” Davis said.